The semi-detached house Jacaranda (on the ground floor) has a shared swimming pool, a garden, various terraces and a barbecue area, at the foot of the Monchique mountains, only 10 km from the sea. Spacious connected holiday home on ground floor with wheelchair access. Situated in a restored Portuguese stately farmhouse ( Quinta ) which is divided in 4 holiday homes. The Quinta has a communal swimming pool (7 x 4 x 1. Apartamentos Encosta da Marina - Praia da Rocha is a self-catering accommodation located in Portimão, just 600 metres from Rocha Beach. The property is 700 metres from Museu de Portimão and 1 km from Portimão Marina. 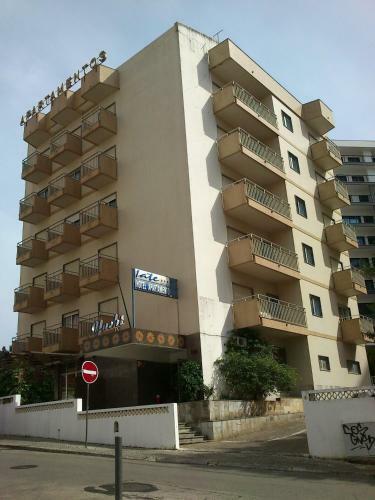 Located 1 km from Vau Beach in Portimão, this apartment features a terrace. Guests benefit from balcony. Free private parking is available on site. There is a seating area and a kitchen as well as a private bathroom. Only 3 minutes’ walk from Praia da Rocha Beach, Hotel Iate offers apartments with private balconies. Tomás Cabreira Avenue, with its restaurants, pubs and clubs, is steps away. Free parking is available.